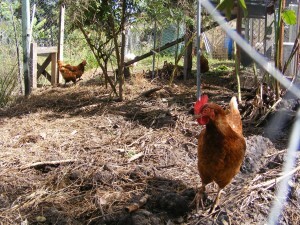 At the Coffs Regional Community garden we are striving to create a full working model of integrated self-sufficiency. From our stand alone solar power systems on our meeting space, composting toilet and aquaponics system to our large rain water catchment tanks, our composting systems, our vast range of edible plants, to our productive animals, we aim to demonstrate the practicality of how we can live abundantly, organically, and as self-reliantly as possible. Having small productive animals managed well within a productive garden setting makes a lot of sense. There really are so many benefits to having these special little helpers around. Some of the key benefits include fresh eggs, manure for the garden, pest control (grass hoppers, snails, slugs and caterpillars),compost turners, nutrient recycling, fish food pellets, animal therapy/pets/ aesthetic value, and all round excellent value in a self-reliance context. Our current productive animal species include, Chickens, Muscovy ducks, Rabbits and Guinea pigs. These four species are all well suited to being raised in suburban situations and all can be fed on a varied diet of garden weeds and excess produce. All can forage for their own foods if given the opportunity, and all contribute to valuable nutrient recycling activities and some (guinea pigs) even create readymade fish food pellets for our aquaponics system. 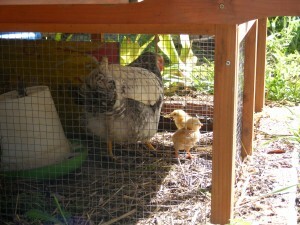 Chickens are amongst the most popular and widely kept small productive animals throughout the world. Their adaptability to different climates and excellent ability to forage for a large percentage of their own food makes them an ideal species for self-reliance. We keep our chickens without a rooster and the hens create only moderate amounts out noise (usually just when laying an egg). Our chickens are kept safe in a fully enclosed 8M x 6M pen that houses both a good sized perching area and a deluxe egg laying house. We have an automatic feeder, shell grit bowl and water in their pen which ensures that their basic needs are always met. When we are at the garden (during current opening times Tuesday and Thursdays 9am to 3.30 pm and Sunday from 10am to 2.00pm the chooks are let out into an expansive run that is full of great foraging opportunities for insects, soft green weeds and worms. The girls also have access both inside their secure pen and the extended run to loose soil suitable for dust baths. We now have eggs available for sale at the garden and many people visiting the CRCG enjoy seeing our chooks living in their own little garden of eden. Muscovy ducks make even less noise than hens, with the drake being almost completely mute and the females rarely making more than soft celebratory melodic sounds. They too have a secure lockup pen for when we are not on site, complete with their own elevated bath tub that regularly supplies nutrient rich water to the banana circle just downhill, and a number of plastic shell ponds also filled with water for their additional enjoyment. Muscovy ducks are their own separate species of water fowl, being unrelated to all the other domestic duck breeds. All of these other breeds are domesticated forms of the wild Mallard duck and these included the Indian runner, Khaki Campbell, Pekin, Rouen, Aylesbury, Blue Sweedish, Call ducks and many other derivatives. Most of these Mallard derived breeds are particularly noisy, especially the females who make the characteristic quack and much more exaggerated versions of the sound. Muscovies have many differences to the other breeds of duck, with the most prominent being the red fleshy caruncles on their faces which are more pronounced in the drakes. Additionally muscovies have a much longer incubation period at 35 days compared to the Mallard derivatives at just 28 days. 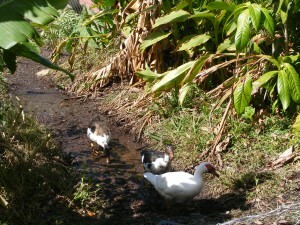 Muscovies are great grazers of grass and other plant material in this way similar to geese. Another distinctive trait of theirs is that the drakes get to almost twice the size of the females and often approach around 7 kilos when fully grown making them exceptional meet birds. The females as well as being much quieter than other female ducks are also quite good egg layers and will produce around 180 eggs in a year if they are not allowed to sit on their eggs. If they are allow to sit, they will lay up to 18 eggs before their exceptional maternal instincts kick in, frequently hatching every egg that they sit on. Muscovies females are can also be used for hatching eggs from other duck species. Like the chickens, our muscovies also have a large and interesting run filled with foraging opportunities for them to enjoy when we are on site. Rabbits are usually very quiet with their greatest noise potential coming from their tendency to thump the ground when alarmed or disturbed. We keep ours in large mobile cages that are used for mowing the grass and we then rake up the manure which is almost odourless and an excellent slow release fertilizer pellet to use in the garden. Our rabbits eat a varied diet of grass and selected lush weeds, to fresh vegetables from the surrounding garden with some occasional supplement of commercial rabbit food blend. Rabbits have a gestation period of around 30 days and give birth into a grassy nest that they have built and then lined with a large amount of the mothers own tummy fur, creating a beautiful warm and protected posy for the new born babies. When first born, baby rabbits are completely without fur and totally blind for 10 days, during which they grow very quickly and develop their first layer of fur. 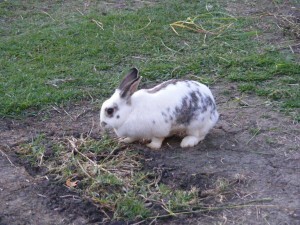 Rabbits were first introduced into Australia for the primary purpose of providing good quality easy to raise lean meet. It did not take long for a few bunnies to dig their way to freedom and the rest is history. Although they have largely fallen from grace as a mainstay meat animal, they still make great pets, produce great fertilizer pellets and for anyone who does eat meat, their lean delicious meat is amongst the healthiest and cleanest of all. 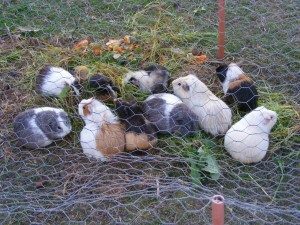 Guinea pigs, particularly when young can squeak quite a lot. This is often as a demand for feeding, but their sound does not carry far and is of a fairly high pitch. Our guinea pigs live in small mobile cages that are used to mow around edges and other more narrow nooks and crannies that the larger rabbit cages will not fit into. Guinea pigs have similar dietary needs to rabbits with fresh green grass, weeds and herbs accounting for as much as 90% of what they prefer to eat. The gestation period for Guinea pigs is around 72 days, but with this much longer development period comes babies that are fully haired and able to run around within hours of their birth. Guinea pig babies are also able to start eating grass often on their first day and have surprising good motor skills and judgment when it comes to assessing potential predators. Guinea pigs are highly valued food in Peru and other parts of South America when they originated, but here in Australia they are regarded as amongst the cutest and best low maintenance of all pets. Our guinea pigs will also be used to contribute their little pellet droppings as fish food for our fully sustainable aquaponics systems. Managing these four species we have found that most food scraps brought in by our members can be dealt with usefully and effectively, for instance all these four species will all eat green leafy vegetable scaps from spinach, lettuce, pak choi etc, Rabbits and guinea pigs will even eat the dry onion and garlic skins (must be like a chip to them), the chooks and Muscovy ducks both enjoy abundant protein in their diet and so will eat food scraps containing meat, with the muscovies being even more voracious than the chooks for their love of protein in that they will eat whole mice and baby rats if they find them or have them thrown their way All four species will happily eat bread as a minor supplement in their diet. Our productive animals form invaluable links within our overall productive system, bring great joy for our members and visitors to watch and appreciate, and they help immensely with keeping our organic garden in an optimal state of health and productivity. If you haven’t been to the CRCG to see our animals and many other attractions, you’ll be amazed and inspired by what is possible in a short period of time.